Are Anna and Elsa at the Akershus princess breakfast? Tom, gee, what a great question! Now that everyone’s favorite princesses (I’m sorry, a princess and a QUEEN) have moved into Epcot’s Norway, doesn’t it make sense for them to appear at a character breakfast? Sure does! 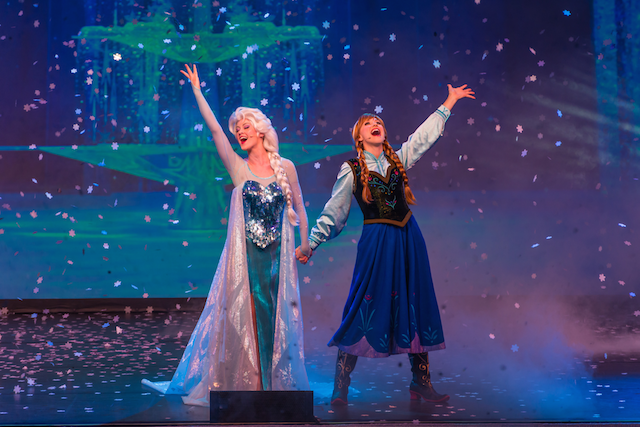 But will you find Anna and Elsa at Akershus? Not any time soon. With the opening of Frozen Ever After (replacing Maelstrom) in the Norway pavilion, many guests have been hopeful for the same thing. Sadly, the royals of Arendelle aren’t appearing at breakfast, lunch or dinner at Akershus Royal Banquet Hall. Back to Frozen. While character dining seems like a great idea to get folks to pay even more money for some must-see princesses, don’t expect the girls to be making an appearance in the near future. They have a whole new Royal Sommerhus area set up for their meet and greet. And a word to the wise – there is NO FastPass+ option available at this time. As for Akershus, it’ll be business as usual. Your meal will start off with a greeting from Belle and a photo opportunity before you even enter the main dining room. Then, an ever-changing roster of Disney’s leading ladies will circulate around the room while you dine. Usually you’ll see about 4 characters, which may include Cinderella, Snow White, Aurora, Ariel (in her ballgown), or even Mary Poppins. At points throughout the meal, kids join in a special Princess Processional. It’s a lot of fun, even for us Dads. Tom, In the future, I’d love to see Anna and Elsa make their way to character dining – and maybe the Royal Sommerhus could be converted into another location for Bibbidi Bobbidi Boutique. But for now, that’s not in the cards, so I’ll just have to let it go (Dad sings good).